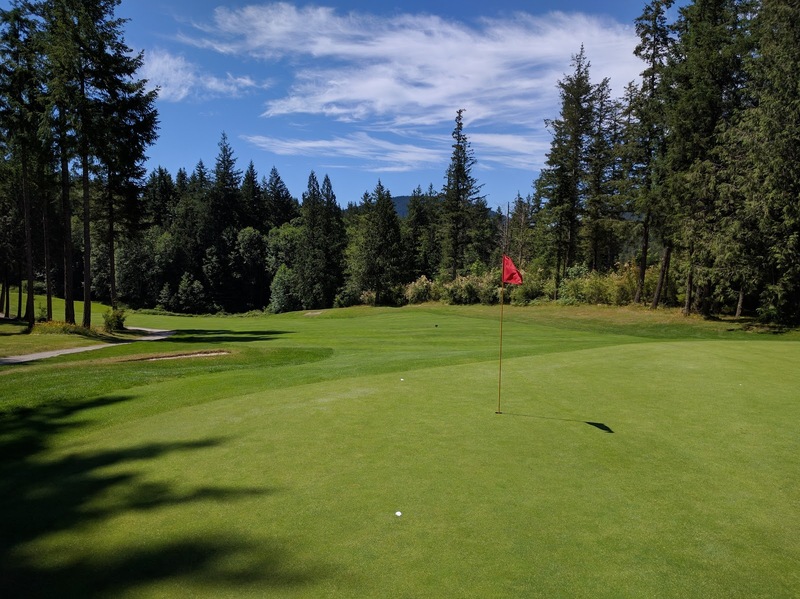 Turf Hacker: Why Use Less Fertilizer? There has been quite a bit of talk on twitter lately about certain products that allow superintendents use less fertilizer. For me, fertilizer use has always been one of the most interesting, and confusing parts about my job as a golf course superintendent. Last week while at the Green Expo in Minneapolis I was again afforded the opportunity to meet and talk with a lot of great people. As usual, during these discussions I learned a lot about some new things and also about things I thought I already knew. Discussing ideas that I already have with new people always allows me to refine the idea. I especially enjoyed talking about fertilizer use with the Minnesota superintendents. Why do we fertilize our grass? It's a simple question but the more I think about it the more puzzled I get. In my opinion, we fertilize grass to make it grow faster. If our grass has enough fertilizer it will grow fast enough to provide a dense, uniform stand that tolerates the amount of traffic and stress that we put it through. You don't know how fast it should be growing. Both of these things are very easy to measure but still, very few of us do it. The more I think of it, the more I think that if you want to optimize your fertilizer use, measuring clipping yield is essential. If not, you are introducing too much guesswork and the long term success of your fertilizer use plans will not be sustainable. I also had a discussion with a local grass killer about fertilizer rates on his tee boxes. According to the super they are too soft and thatchy. I said, if they are growing fast enough why fertilize them? Do you fertilize because of the date on the calendar or....? Do the divot heal adequately? If so, maybe reduce your nitrogen rates. Minimalism. I'm a bit sick of this term and how it has been applied to what I do at my club. Sure, I might use a lot less than some, but from my standpoint I am not using less. I am using the right amount because I know how fast I need to grow my grass, how fast it is growing, and only apply what is needed to achieve this optimum growth rate. For me, fertilizing used to be about using less but since then I've hit the bottom and I've discovered what low rates mean for my grass and what I am trying to achieve. This past year I applied the least amount of fertilizer on my greens than I ever had without adding any additional products that allow me to use less fertilizer. On the greens that weren't damaged last winter I applied just over 84kg N/ha (1.7 lbs of nitrogen per 1000 sq ft) for the year. This is a poa/bent mixture and the grass did just fine as far as most would be concerned. I also spent only $130 on N P and K for my 0.4 ha (1 acre) of putting greens. Maybe this is why I'm skeptical of products that promise to save me money on fertilizer. The economics just aren't there for me. I can use less fertilizer by simply applying less. I have a hunch that because I wasn't measuring growth rates (in a meaningful way) in the past, I was playing it safe by over-applying fertilizer on my course. 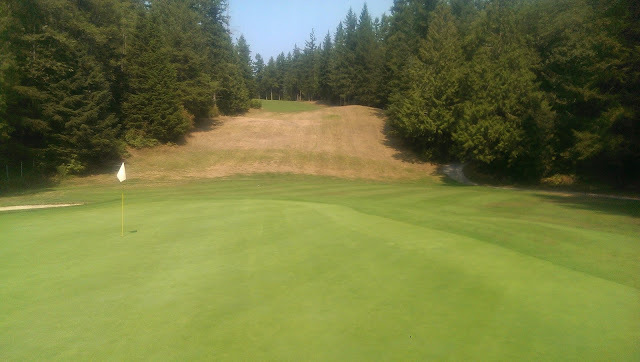 I had good conditions, but probably spent more on fungicide, mowing, and corrective cultural practices than I do now. It turns out I was over applying fertilizer and simply applying less resulted in these great conditions. Surprise! But it's not a contest. I hear lots of stories about trends in golf course maintenance over the years and going super low isn't anything new. Typically it will be trendy to go low for a while then everyone's grass dies and rates come back up. That's the story I've been told anyway. I started at the period of excess in 2007 so I don't have any first hand experience with previous periods of minimalism. Poa was doing just fine with the lowest nitrogen rates ever on our greens. So maybe you're wondering how much fertilizer I plan on using in 2018? What I do know is that I am very happy with the low growth rates I have been achieving in the off season months. I will continue to grow my grass relatively slow this time of the year in 2018. I am unhappy with the growth rates last summer and more specifically how they probably resulted in the need for a few extra fungicide applications for dollar spot. The low growth rates were totally fine as far as traffic and wear were concerned even with daily rolling (or double rolling). 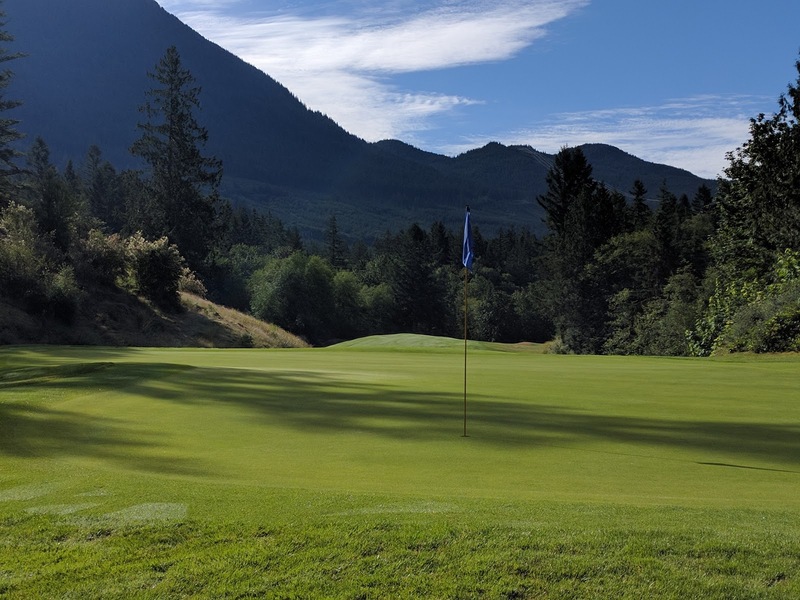 I am confident that the growth rates that I aim for in the summer could handle a lot more traffic than the 2000 rounds per month we throw at them in the summer. 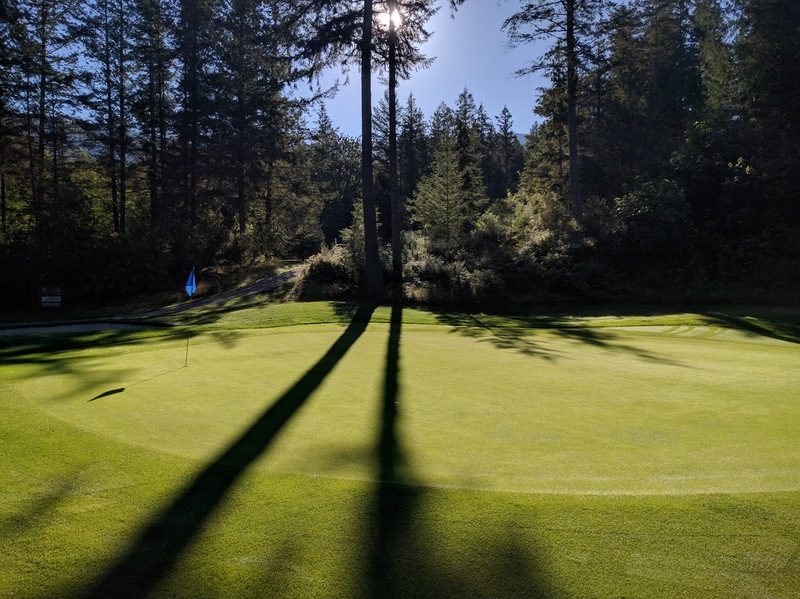 I found this article about the Vineyard Club superintendent, Kevin Banks interesting, and specifically liked how they use high growth rates to outgrow the disease. The findings from the Vineyard Club have always been especially useful for me and my understanding on how to grow good grass, organic or not. Even if you aren't aiming for organic golf, their practices and findings will help improve conditions at most clubs. This is my strategy too when it comes to dollar spot. Last summer I noticed that the dollar spot on my greens was worse on greens with lower growth rates than those with higher growth rates. The opposite was true with regards to microdochium nivale. 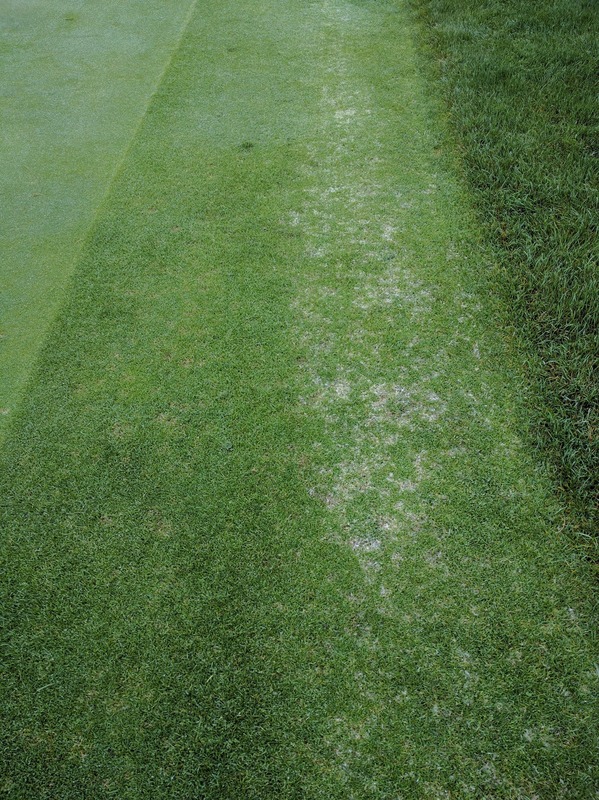 Last summer I did not get the growth rates high enough and as someone who is also trying to reduce fungicide use, this resulted in more dollar spot and the need for corrective actions. My sprayer boom only reaches part way across the collar on this green. Look at the impact the extra nitrogen has on disease rates. In 2018 I will be monitoring growth rates and will be fertilizing my grass to outgrow dollar spot. I won't be "pounding it down" as some might think. I will be measuring, adjusting, and evaluating so that I only grow it just fast enough to reduce disease, nothing crazy. I do, after all, have to consider playability here and out of control growth only impacts playability negatively. Excess thatch, clippings everywhere, and soft bumpy and slow greens. No thanks! So It's highly likely that I will be using more nitrogen on my greens next year because when it comes to fertilizer use, it's not about using the least amount, it's about using the right amount for my specific needs of my course. It's about reducing the guesswork and waste. So I'm sorry if I don't buy into the products that promise to save me money on fertilizer or fungicide. I think that by reducing the guesswork surrounding fertilizer use, we can optimize and in some cases reduce the amount of fertilizer used in a sustainable way that might even reduce our need for fungicide or other corrective pest control or cultural practices. Who knows? It's not minimalism, it's optimization. Next month I will be at #GIS18 doing a seminar on the #MLSN guidelines with Larry Stowell, a seminar on Minimalism, and participating in a panel discussion about social media. I will also be attending a conference in Moncton!